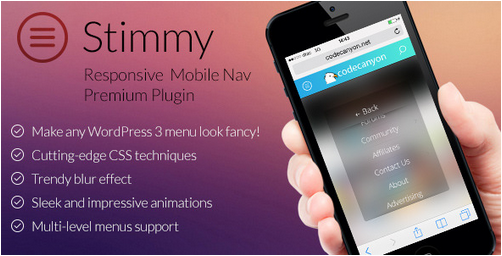 Stimmy is a premium WordPress plugin that generates a responsive navigation menu using your theme standard menu as source (see requirement). Navigation is very important part of user experience and Stimmy makes it easier for small screens. It uses cutting-edge CSS3 techniques like blur effect for whole page (with fallbacks if blur is not supported) and various animations for menu. Works on iOS, Android, Blackberry and Windows Mobile if device browser supports required features, if not it's just not generated.